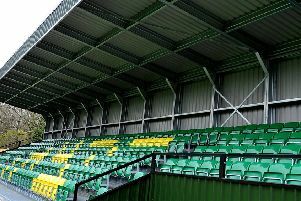 Horsham manager Dominic Di Paola felt a draw with Ashford United on Staurday in the top-of-the-table Bostik League South East Division clash was just about the right result. Then second-placed Horsham started the day a point ahead of their third-placed visitors and that is how it remained at 5pm in the 0-0 stalemate at Culver Road. However, Hasting United’s 3-1 win against Three Bridges saw them leap into second place, while fourth-placed Haywards Heath drew with leaders Cray Wanderers. Ashford were by far the better side in the first half and it kept an alert defensive shift as well as a couple of smart stops from Josh Pelling to keep the scores level at the break. Horsham were much improved in the second half and their best chance actually saw Chris Smith smash home a rebound from a saved shot, but it was ruled out by a late offside flag - which later has been shown on video to be an horribly incorrect decision by the assistant referee. Speaking before seeing the match footage on Saturday, Di Paola said: "They were the better team by miles first half. We were just off it and not where we could be. They didn't create a huge amount of chances, but dominated. They were just up for it and in and on us a lot quicker. Fair play to them. "I think in the second half we were the better team apart from a couple of little spells. I need to check the video, but I am adamant that wasn't offside, but let's see the video first. I was pretty confident it wasn't offside. "In the second half we were a lot more confident and played a lot more like ourselves. I think we were marginally better, but I think it's a fair result overall, although they did have the better chances. "They are a good side. They play good football and have lots of mobility. They have good players, but you would expect that. They are where they are in the table and we knew it was going to tough. I am happy with it. I would have said a draw fair, maybe they were marginally better." The manager has since tweeted his dismay at having a perfectly good goal chalked out at the start of the second half. The match video clearly shows Smith is well onside -being played on by two different Ashford players - when Harding unleashes his effort from outside the box. Horsham were mid celebration before a late flag was spotted by the referee and upon consulting his assistant, the goal was ruled out. It came just three minutes into the second period and as a result of a formation change with saw Joe Shelley pushed back into a three-man defense with Harvey Sparks and Steve Metcalf pushing into wing-back roles. Di Paola added: "It worked better and it's not something you like to do, but we weren't getting to grips in certain areas and I felt it would give us more of a chance. I think it did. "Second half they didn't create the chances they were and we didn't get caught as squad. Harvey (Sparks) got on a more and played really well, Mets (Steve Metcalf) played well as well. "Up front with Lee (Harding) and Smudge (Chris Smith), they were able to get a bit nearer their players, so it worked a bit better."